Create market opportunity, gain exposure and drive guest enjoyment with these portable square food court table sets. The diamond pattern steel food court table is available in two heights, 30" and 42", providing comfort, convenience and accessibility. 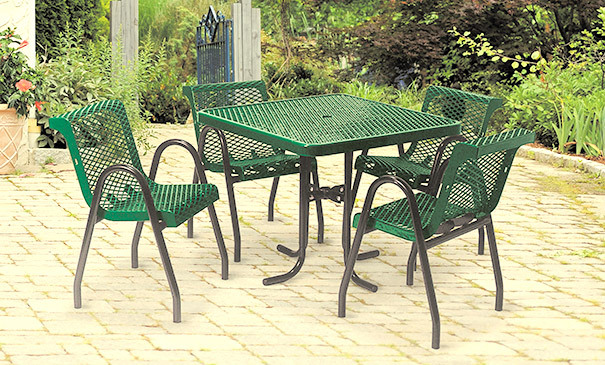 Designed with all steel construction, table top and seats are polyethylene coated while the frame is finished in a trusted powder-coating that is engineered to maintain its smart look. As a result of the incredible strength of expanded steel, these tables and chairs are popular for use in just about any climate. With no broad surfaces to collect water, the diamond pattern naturally dries-off quick after rainfall. Complementing arm rest chairs, in matching expanded metal, are available to provide a cohesive look. The smooth rounded edges of the table and chairs gives an added comfort feature for users and better grip for lifting. Just add umbrella (Sold Separate), for a greater guest experience and patio aesthetic, tables come standard made with a 1-9/16" I.D. umbrella hole.